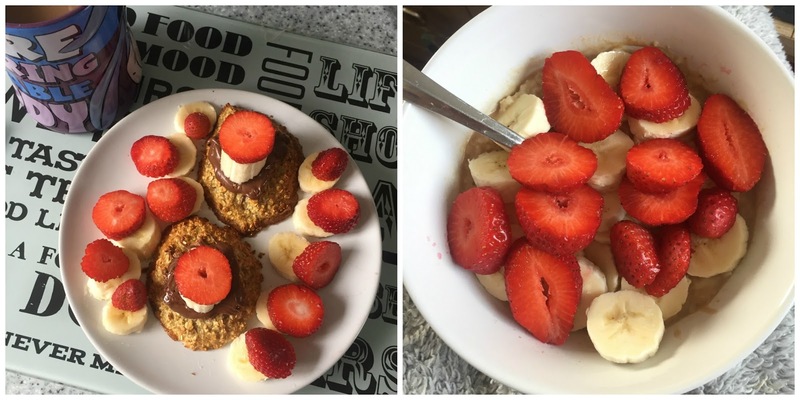 Last year, when I first started Slimming World I shared what I was eating quite regularly here on my blog. This was great for me to remember some of my favourite meals and to mix things up a bit. Now that I've been maintaining for a few months and my wedding gets ever closer I've decided to mix things up a little and try some new recipes. I've definitely got into a routine and have been eating the same thing week in week out and if I want to lose another few pounds I need to get back to basics. One of my new breakfast favourites is overnight oats. I posted all about it just the other day and I've been keen to try out a few different combinations since. The thing about overnight oats is there's no faffing about in the morning, you just grab your jar and spoon and go. I like this for the mornings when I've got jobs about the house to do before work. I think my fiancé will quite like this for taking to work because he's much more of a hit the snooze button sort of person. Another breakfast that I've brought back is Honey Monster Puffs with fruit and yogurt. 20g of puffs is half a Healthy Extra B and I could use milk but to avoid using up my Healthy Extra A I quite like Toffee Muller Light with it. 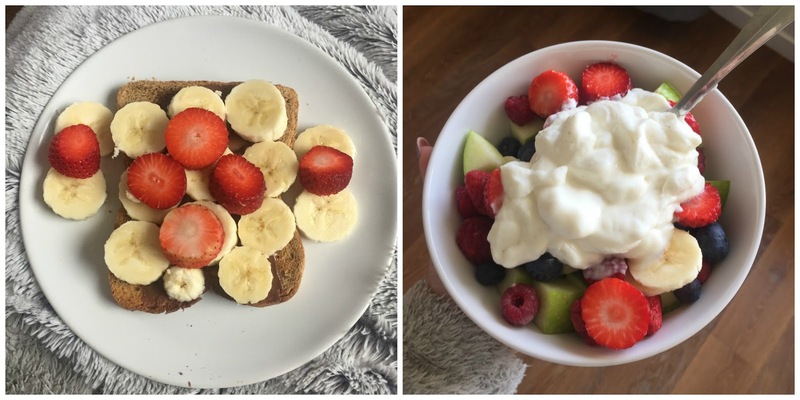 Banana, strawberries and blueberries is the best fruity combo for this tasty breakfast. Another breakfast that uses my Healthy Extra B is good old Nutella on toast with banana and strawberries. Nutella is 4 syns for a tablespoon (15ml) and on warm toast that's the perfect amount for a sweet treat in the morning. 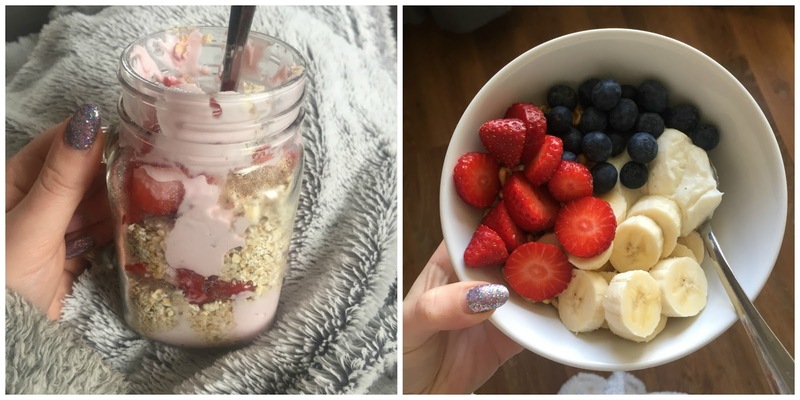 I don't have this breakfast during the week and I prefer to keep my syns for after work. One of the best breakfasts for saving all your Healthy Extras is fruit and yogurt. I've got a whole fruit bowl in here by the looks of things - banana, apple, strawberries, raspberries and blueberries- all topped with some Vanilla Skyr Protein yogurt. All syn free. Another tasty weekend breakfast that I shared the recipe for is breakfast biscuits. A good one when you've got a little extra time and again using 4 syns of Nutella. I think there's a bit of a fruit trend going on here, strawberries and banana are definitely my favourite. The last breakfast that's made a comeback is porridge. I have the original Quaker Oats with Almond Milk and Walden Farms Caramel Syrup. I love the syn free syrup for transforming boring porridge into something delicious. 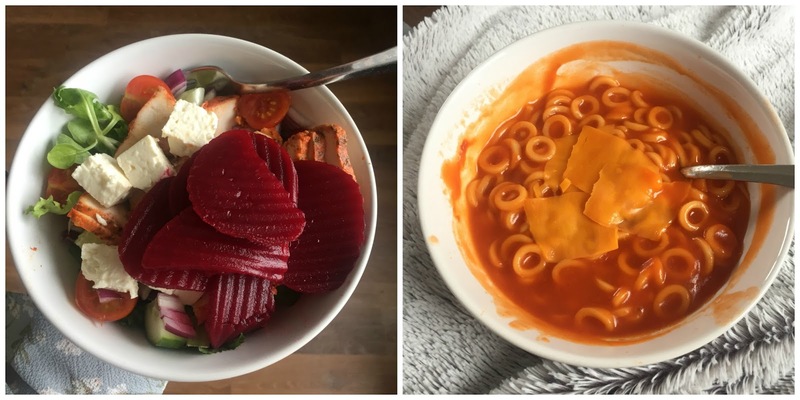 I have a packed lunch at work every day and in the Winter I mix it up by having different soups while in the Summer it's all about the salads. I take the easy option by buying a bag of salad leaves and add in tomatoes, cucumbers, chicken chunks, feta cheese and beetroot. I prep my lunches on a Sunday so each morning I just grab a box from the fridge and go. Another lunch favourite is good old spaghetti hoops. Perfect if you've got nothing else in spaghetti hoops is a syn free tin of yumminess. Topped with some cheese and I feel like a big kid again. 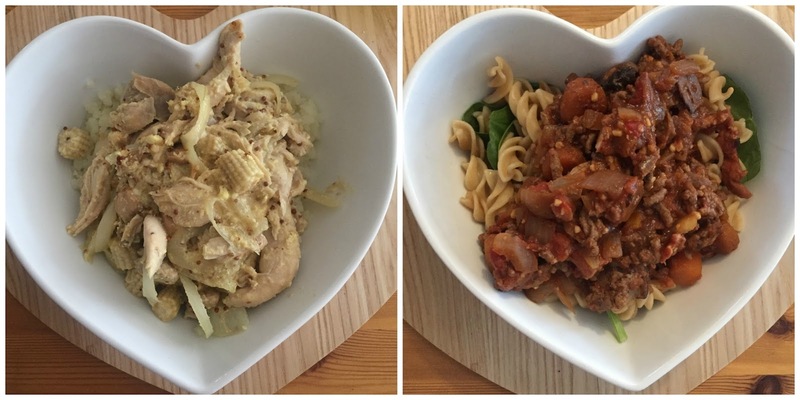 Two recipes that I've tried out this week from the Slimming World website is Chicken Supreme and Beef Ragu. Both were a total hit with my fiancé and so easy to make after a day at work. I made the Chicken Supreme with leftover roast chicken from our Sunday dinner and I had it with cauliflower rice as an SP meal. I couldn't have the Beef Ragu without pasta but I made sure to have a layer of spinach for speed and to reduce the carbs. Something I've never had since starting Slimming World was a fry up. A totally syn free fry up at that. This 'breakfast for dinner' was made up of Linda McCartney Veggie Sausages, bacon medallions, spaghetti hoops, mushrooms, a poached egg and potato cubes fried in fry light. What a feast. 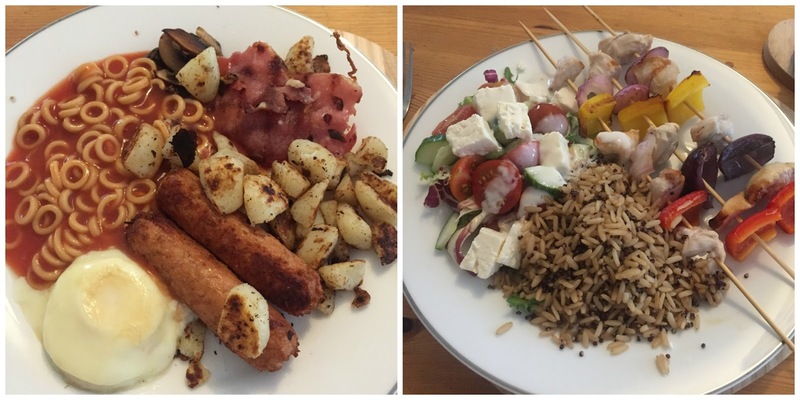 This week we also had a BBQ inspired meal of chicken skewers, salad and wholegrain rice with quinoa. Walden Farms came up trumps again with their syn free caesar dressing. 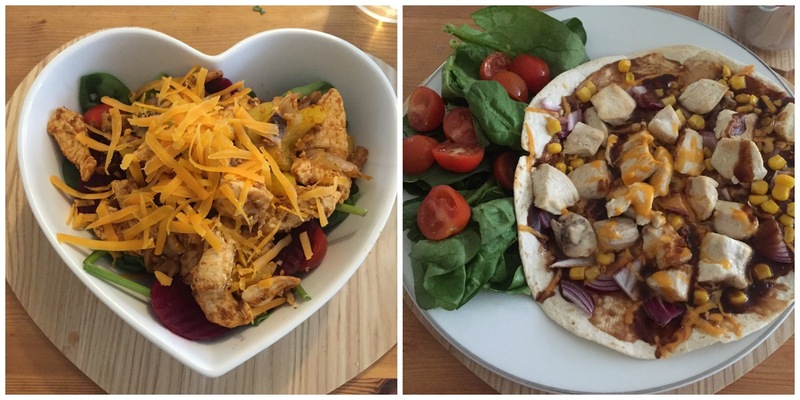 Before Slimming World I would think nothing about having chicken fajitas for dinner each week and have two or three wraps. Now when it comes to fajitas if I've got my Healthy Extra B I'll have one weight watchers wrap but if I've already had it then a fajita salad is the way to go. I've got the same chicken, onions and peppers as my other half but it's served with spinach, tomatoes, cheese and beetroot instead of the wrap. Speaking of wraps I love a wrap pizza. Some homemade BBQ sauce, chicken, sweetcorn, red onion and cheese all cooked in the oven for 10 minutes. I don't feel like I'm missing out.